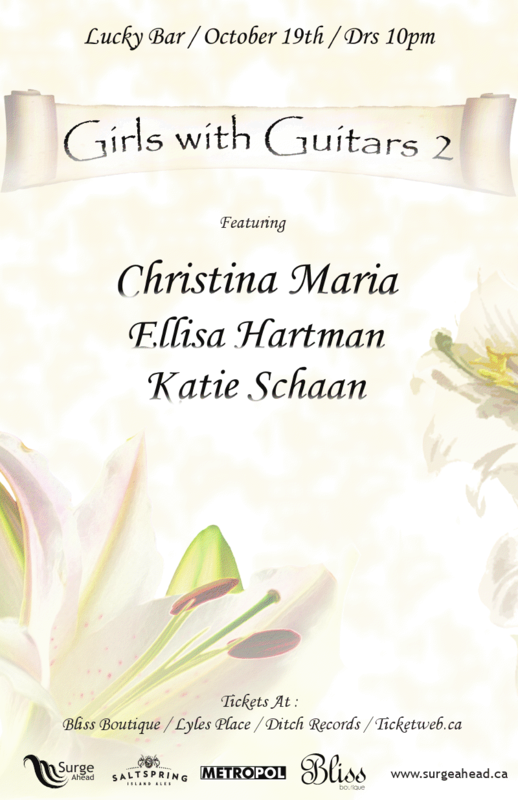 Island SoapBox is proud to be covering "Girls with Guitars 2" at Lucky Bar, coming Tuesday October 19. Three incredibly talented singer/songwriters will take the stage that evening, and Island SoapBox wants you to know a bit more about them before you come out and see them! You know when you meet someone, and it's clear from the get go that they have an abundance of energy? That's my first impression of Katie Schaan. She was more than happy to meet with me in the morning of Thanksgiving Monday. She seemed genuinely excited about everything, and I'm sure she puts this enthusiasm to her show as well, I can not wait! To be so excited makes sense. "Girls with Guitars" was her creation. Finding it tough to get the same sort of attention that other bands were getting, Katie saw the potential in having a night featuring strong local female talent. "It was something I had been thinking of doing. Richelle (Newson) started working with Surge Ahead right around when we did the first "Girls with Guitars". I had been wanting to put together a show that showcased female performers. It looked like a good opportunity to be like "Hey Richelle, this would be some good practice for you, do you want to do this together?" and she just jumped right on board, which is really, really cool. It’s just really exciting. It's something that's always been really important to me. 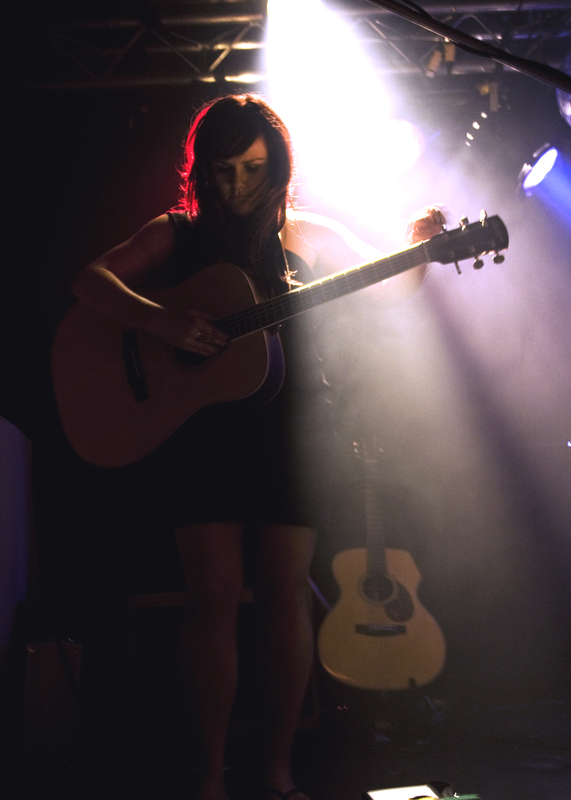 I've had a hard time being a girl, especially in Victoria, being a musician. Not that people aren’t supporting or encouraging, but there just aren’t really as many of us as compared to the boys, and we all play acoustic guitars and keyboards. You can’t really put us on a bill with a lot of the guys cause we're all sorta mellow and sing songy. So I wanted to do something that was "Everybody take a look and see what the girls can do, cause we can play too". So I'm excited to be doing another one. And Christina Maria, who is one of the top 20 Peak Performance Project members, is coming over to play, which I am so excited about, she’s amazing. And Ellisa Hartman is just the sweetest little girl, she’s super endearing and wonderful to watch, so it'll be good." 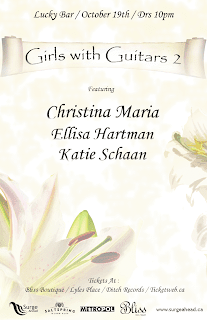 Besides "Girls with Guitars", Schaan also has a tour and an album release coming up. It's funny, because as music fans, I think we enjoy when an artist shows they can play within different genres. But at the same time it seems more difficult for the artist to sell themselves, if they don't belong to a certain genre. "There was some debate as to whether or not I was going to release it until the New Year. I kind of live in this limbo land between Indie music and pop music and it's kind of hard to fit in either side. There was some debate as to whether I would add a few more tracks before I released it, but I’ve decided to just release it and maybe record a new EP in the New Year that’s closer to one side or the other. I’m hoping to have it before I go on tour in November, but we'll see. It was a long process, I started working on it, I guess almost 3 years ago now, and my ex bf was producing it. So when we broke up that obviously wasn't going to work anymore. So I had to find a new producer and it ended up being the best thing that could have happened to me. It’s been a really positive experience having worked with Adam Sutherland producing it. He was just so encouraging and so fun to be in the studio with. It's gonna feel good to have it in my hands for sure." It may be her first tour, but the Victoria artist has put her own twist on her merch table. "Katie-made hats and scarves knit from Vancouver Island Cowichan Wool". "It'll be my first tour, so that’s very exciting. Steph Macpherson is going to be coming with me for some of the dates on the mainland, and I'll be doing some of them with other artists, some of which I know, some of which I don’t know. I’m playing at the Duncan Garage with two artists I had never heard of before, and who are nothing like me, so we'll see how that goes. I’m sure it'll be fun, and playing at the garage is always fun. It's a little bit scary but I'm really excited. And because it’s my first tour I’m only really playing in cities where I know people, or have friends and family and stuff who I know will come out. These are the people that have been like "When are you coming to play music for us?" so it’ll be really good. Knitting is coming along slowly but surely. I was over in Vancouver for the last week playing for the last Peak showcase (with Macpherson), so there hasn’t been a lot of time for knitting in the last few weeks. Yesterday I had to play a little bit of catch up, but I think it'll be good, it’ll get done... I hope." Her enthusiasm shines through the entire interview. You can feel the jitters and the excitement as she talks about them. Schaans' passion for music is evident the whole time, it's clear this is what she wants to do whether it's her own, or along side someone like Macpherson. "Honestly I would take any excuse to play music. I don’t care who it’s with, or what genre we're playing or what instrument I’m playing, I just want to be making music. So it's extra exciting to be playing with someone like Steph who is seeing a certain amount of success these days. Yeah I love it. I love it almost as much as singing my own stuff." That full fledged love will shine through Tuesday October 19, when Katie hits the stage again for "Girls with Guitars" at Lucky Bar.